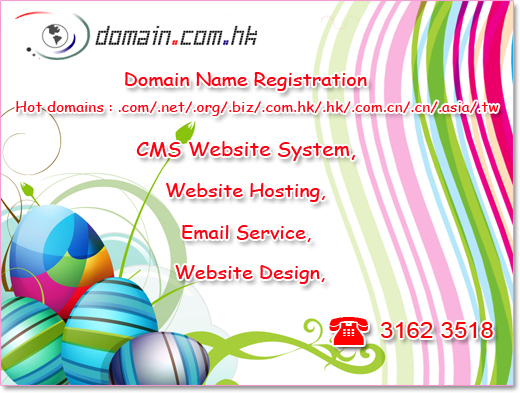 HK domain name registration and international domain name registration, e.g. .com, .org, .net, .com.hk, .org.hk, .net.hk, .edu.hk, .hk, .jp, .co.kr, .kr, .com.sg, .sg, .com.tw, .tw, .asia, .tel, .com.au, .co.nz, .travel, com.ph, .ph and etc..
Vitual server management and hosting, Wordpress server supported and CMS website design, website templates as well as CMS website builder services. 域名登記包括：.com, .org, .net, .com.hk, .org.hk, .net.hk, .edu.hk, .hk, .jp, .co.kr, .kr, .com.sg, .sg, .com.tw, .tw, .asia, .tel, .com.au, .co.nz, .travel, com.ph, .ph 等等.